Four reasons why the background-check measure went down to defeat (despite having so much going for it)… 1) The NRA still packs a punch with Republicans and red-state Dems… 2) The red vs. blue divide… 3) The upcoming 2014 midterms… 4) The House’s likely inaction on the legislation…. The White House’s goal: making sure the defeat doesn’t spill over to immigration… Baucus: Health-care “train wreck” is coming… On the NRCC’s decision to pull the plug on Sanford… And Kasich, per new poll, appears to sitting pretty one year before re-election. President Obama reacts to Senate's failure to pass a deal on expanded background checks for gun purchases but shows hope for future passage. *** Why the gun measure went down to defeat… : President Obama today heads to Boston to participate at an interfaith service for those killed and wounded at Monday’s marathon bombing. And his White House (via FEMA) is keeping its eyes on that terrible and violent explosion in West, TX. But politically, he and his team still have to be thinking about yesterday’s gun defeat in the U.S. Senate and strategizing to make sure this loss doesn’t spill over into other items on his 2013 agenda. The outcome wasn’t a surprise -- after all, our headline from last Thursday was “Why immigration reform has a better chance of passage than gun control” -- but supporters are angry and a bit shell-shocked after the defeat of a bipartisan amendment on background checks. “Speaking is physically difficult for me. But my feelings are clear: I’m furious. I will not rest until we have righted the wrong these senators have done,” former Rep. Gabby Giffords (D-AZ) wrote in the New York Times. The president himself said yesterday, “All in all, this was a pretty shameful day for Washington.” But four different factors played important roles in the amendment's defeat: the National Rifle Association's power, the country's red-blue divide, next year's midterms and the U.S. House's likely resistance to any gun-control bill. 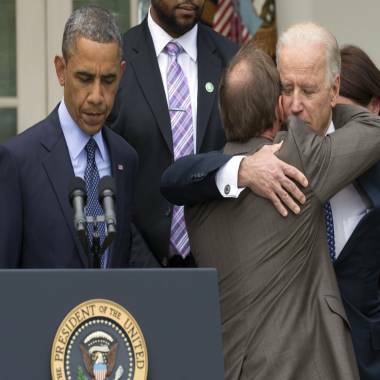 President Barack Obama stands at the podium at left as Mark Barden, the father of Newtown shooting victim Daniel is embraced by Vice President Joe Biden during a news conference in the Rose Garden of the White House, Wednesday, April 17, 2013, about measures to reduce gun violence. *** … despite having so much going for it: The bipartisan Senate measure to require background checks for almost all firearm sales had so much going for it. Nine-in-10 Americans supported it, according to polling; newly elected Obama campaigned for it, as did the families of those killed in the tragic Newtown shootings; Michael Bloomberg’s groups spent heavily on TV ads urging its passage; and it finally had bipartisan sponsors with "A" ratings from the National Rifle Association -- Sens. Joe Manchin (D-WV) and Pat Toomey (R-PA). But the amendment, as expected, went down to defeat on Wednesday, jeopardizing the fate of the Democratic-backed gun-control legislation. Above all, the defeat confirmed that while gun politics might have changed after the tragic Newtown shootings (think of the new state laws in CO, CT, MD, and NY), it hasn't changed enough to get 60 votes in the Senate. The background-check measure fell six votes short of that threshold, 54-46. *** The NRA still packs a punch: Last week, gun-control advocates rejoiced when the Senate defeated a GOP-backed filibuster and began debate on gun-control legislation. They also celebrated after Sens. Manchin and Toomey struck a compromise deal on background checks to cover all gun-show and online sales of firearms (excepting for family transfers). But after that agreement -- and after the two senators thought they had the NRA's tacit agreement not to oppose their amendment -- the gun-rights organization pulled its trigger by releasing a letter opposing the amendment and suggesting it would score the vote. After that NRA opposition, any momentum the Manchin-Toomey amendment had stopped. In fact, a number of red-state Democrats and fence-sitting Republicans later opposed the compromise measure. Further demonstrating the NRA’s power on Wednesday, a pro-gun-rights amendment to enable those with concealed-weapons permit to carry guns across state lines (even in states where that action isn’t legal) garnered more votes (57) than the Manchin-Toomey measure (54). This fact perhaps tells the story of the gun debate better than any other. *** The red vs. blue divide: But when it came to the background-check amendment, the NRA's power was limited to Republicans and red-state Democrats. Four Dems hailing from red states -- Max Baucus (MT) Mark Begich (AK), Heidi Heitkamp (ND), and Mark Pryor (AR) -- voted against the measure. (Senate Majority Leader Harry Reid was the only other Democrat who voted against it, but that was a procedural move to keep the amendment alive to bring up in the future.) And just four Republicans -- all but one from a red state -- supported it: Susan Collins (ME), Mark Kirk (IL), John McCain (AZ), and Pat Toomey (PA). Yet outside of red states, other Democrats had no qualms standing up to the NRA, even those from states with a long history of gun rights (think Tim Kaine and Mark Warner of VA or Michael Bennet and Mark Udall of CO). Indeed, discounting Reid, 39 of the 45 “nay” votes came from states that President Obama didn’t carry in the 2012 election. The six exceptions: Kelly Ayotte (NH), Chuck Grassley (IA), Dean Heller (NV), Ron Johnson (WI), Rob Portman (OH), and Marco Rubio (FL). (Heller and Ayotte were potential “yes” votes had either of them been the difference makers between 59 and 60.) But Obama’s electoral coalition isn’t a recipe to reach 60 votes in today’s filibuster-happy Senate. As our friend Harry Enten has noted, Obama carried 28 states in his decisive 7-point presidency victory in 2008. That translates to 56 Senate votes if you assume two Democrats represent all of those 28 states. In other words, Democrats must expand their reach into red states to get to 60 votes. *** Midterms on my mind: Another reason to consider in the defeat of the background-check amendment -- next year’s midterm elections. Three of the red-state Democrats who voted against it are up for re-election next year: Baucus, Begich and Pryor. That’s compared with six red-state Democrats who voted for it – Joe Donnelly (IN), Tim Johnson (SD), Manchin (WV), Claire McCaskill (MO), Jay Rockefeller (WV) and Jon Tester (MT) -- but who decided not to run for re-election or who aren’t up for re-election until 2018. Only two red-state Democrats who voted for the background-check measure hail from states Obama didn’t carry in 2012: Kay Hagan (NC) and Mary Landrieu (LA). *** The House effect: A final factor in the defeat of the Manchin-Toomey amendment’s was the doubt that the Republican-controlled House of Representatives would act on the Senate gun-control bill, even if the amendment had passed with 60-plus votes. Speaker John Boehner last week repeated that the House would consider any legislation the Senate passes, but he didn’t commit to a vote. "I fully expect that the House will act in some way, shape or form,” he said. “But to make a blanket commitment without knowing what the underlying bill is I think would be irresponsible on my part," So the possible thinking among some red-state Democrats up for re-election next year: Why should I take a tough vote when the House might not even take up the bill? In fact, we can report that Senate Minority Leader Mitch McConnell made this exact pitch to his GOP colleagues who might have been considering voting for the measure. -- What's next on guns? Per NBC's Kasie Hunt, the background-check failure likely marks the end of the entire effort in the Senate. Yesterday, even the most uncontroversial piece of gun legislation -- a trafficking bill with NRA support -- went down. Senate Majority Leader Harry Reid wouldn't get cloture on the final bill, and he may pull the whole package from the floor as soon as today. Now comes the anger. Gun-safety groups are already out promising they'll hold senators to account come election season, with the Giffords group holding a press conference this morning at 10:00 am ET to emphasize as much. Giffords husband Mark Kelly has already said he will work to defeat Sen. Jeff Flake. *** White House’s goal: making sure the defeat doesn’t spill over into immigration: As for Obama, yesterday was his first big legislative defeat since his re-election. He and his political team probably knew the defeat was eventually coming (remember, his State of the Union called for votes on these measures, not their passage), but they have to be surprised the defeat came so soon. And their top objective now: making sure the legislative defeat doesn’t spill over to immigration. As we wrote last week, immigration has A LOT more going for it than gun control ever did -- half of Republicans support citizenship for undocumented immigrants, and GOP leaders have a desire to pass immigration reform. Still, even immigration reform won’t be easy. Just see the inaccurate rumor that conservatives -- including Sen. Jeff Sessions’ (R-AL) office -- are spreading that the Gang of Eight bill gives free cell phones to undocumented immigrants. Many immigration-reform opponents will view yesterday as an opening to defeat this bill, too. But there is a real divide within the GOP, which is exactly why it’s likely to pass even if things get ugly, like it did yesterday. Sessions and his office must be betting Rubio will never be president, because one assumes the Florida Republican have a long memory about this “Marcophone” hit. *** Baucus: Health-care “train wreck” is coming: We can tell you that many national Democrats who blame Sen. Max Baucus (D-MT) for the LONG time it took for the health-care law to be passed aren’t too pleased with this news. The AP: “A senior Democratic senator who helped write President Barack Obama’s health care law stunned administration officials Wednesday, saying openly he thinks it’s headed for a ‘train wreck’ because of bumbling implementation. ‘I just see a huge train wreck coming down,’ Senate Finance Committee Chairman Max Baucus, D-Mont., told Obama’s health care chief during a routine budget hearing that suddenly turned tense.” Baucus, as we write above, is up for re-election next year. That said, he doesn’t really have a top-shelf opponent, at least not yet. *** NRCC pulls the plug on Sanford: Here are all the developments in South Carolina’s special congressional race after the political world learned that Mark Sanford had been charged, according to a court complaint, of trespassing at his ex-wife’s home: NBC News confirmed that the National Republican Congressional Committee has decided -- for now -- not to assist Sanford in the race… MSNBC’s Jessica Taylor adds that the NRCC “was completely blindsided by the Sanford news and was incredibly upset not just over the incident but by the lack of advance warning.”… House Majority PAC, a Democratic Super PAC, announced that it will begin airing a new six-figure TV ad hitting Sanford for his affair and misuse of taxpayer dollars… And Sanford launched his own TV ad knocking Democratic opponent Elizabeth Colbert Busch for getting union support, per National Journal. As for the NRCC’s decision not to engage in the race, we can report that they had their concerns about Sanford for a while. If anything, there are some who are disappointed by the timing (coming after the trespassing news) and not necessarily the decision. But many Republicans are worried that what leaked out yesterday is just the beginning. *** A year out, Kasich sitting pretty: Remember when Ohio Gov. John Kasich (R) was viewed to be vulnerable heading into his 2014 re-election fight? Well, he’s not so vulnerable anymore. According to a new Quinnipiac poll, 52% of Ohio voters approve of his job, and he leads two potential Democratic challengers by high single digits -- up 46%-37% over Cuyahoga County Executive Ed Fitzgerald and up 45%-38% over U.S. Consumer Financial Protection Bureau Director Richard Cordray The one area where Kasich might be concerned is that he’s only in the mid-40s in these ballot tests. You always want to be closer to 50%.